After the Emperor dissolved the Galactic Senate, the Senators were officially removed from any role in the Empire’s governance. Yet one of those politicians had stood with the Rebellion from the beginning and would continue to shape the course of events across the galaxy: Leia Organa of Alderaan. In the aftermath of her homeworld’s destruction by the Death Star, Leia is more determined than ever to overthrow the Empire and restore the Republic, and you can use her diplomatic know-how and leadership skills with the Leia Organa Ally Pack for Imperial Assault! The Leia Organa Ally Pack is an upcoming figure pack expansion for Imperial Assault, offering a sculpted plastic figure of Leia Organa that you can use to replace the token found in the Return to Hoth expansion. 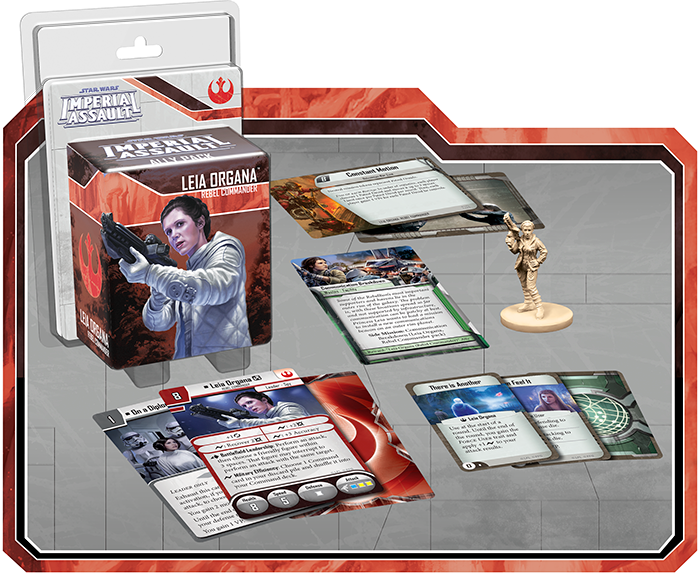 With this figure pack, you can make Leia a force to be reckoned with in your campaigns and skirmishes with new Command cards, a new skirmish upgrade, a new campaign side mission, and two new skirmish missions. In today’s preview, we invite you to take command of a Rebel strike team and engage in aggressive negotiations with Leia Organa herself! After R2-D2, Leia Organa is the second figure in Imperial Assault to have two Deployment cards—one for your campaigns and one for skirmish games. In the campaign game , Leia can be a powerful ally for your heroes as you fight to complete your missions against all odds. Though Leia may not be the hardest hitter on your team, her inspirational leadership makes her well worth including. In combat, Leia Organa receives a constant evade to negate one your opponent’s surges, while she can spend her own surges to deal extra damage, recover damage, or improve her accuracy. Your opponent may not expect to take significant amounts of damage from Leia, but she’ll rarely be attacking alone. As an action, Leia Organa can use Battlefield Leadership to perform an attack and choose a friendly figure within three spaces. The chosen figure can then perform its own attack against the same target, and in this way, you can ensure that your strongest hero makes multiple attacks each round, potentially taking down entire squads of enemies under the direction of Leia Organa. Leia can also use her Aggressive Negotiations to tip the balance of combat, spending a surge to exhaust any Imperial Class card. As the campaign goes on, the Imperial player will gain more and more powerful Class cards, including some of the new cards we looked at in our last preview of the Return to Hoth expansion. Since many of these Class cards must be exhausted to be used, the ability to exhaust one simply by spending a surge can certainly prevent the Imperial player from carrying out his nefarious plans to destroy the Rebels. The skirmish game version of Leia Organa features the same baseline of stats—including health, speed, attack and defense dice, and surge abilities. She also retains the Battlefield Leadership ability, which, if anything, is more powerful in a skirmish game. More attacks means more chances to destroy an enemy figure before it activates, potentially granting you more victory points for destroying an enemy unit. 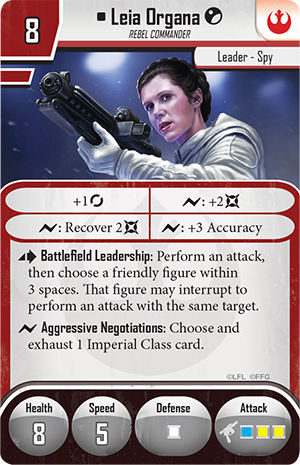 Of course, your opponent won’t have Class cards in a skirmish game, so Leia’s Aggressive Negotiations ability is replaced with the equally powerful Military Efficiency. Simply by spending a surge during combat, you can choose one of your discarded Command cards and shuffle it back into your deck! Before Leia Organa arrived on the battlefield, most Command cards could be used, at most, once per skirmish game. Now, you can potentially use a powerful Command card like Son of Skywalker twice, or even more often, in a single game. You can also send Leia Organa or another Leader to engage in negotiations with the new skirmish upgrade, On a Diplomatic Mission . 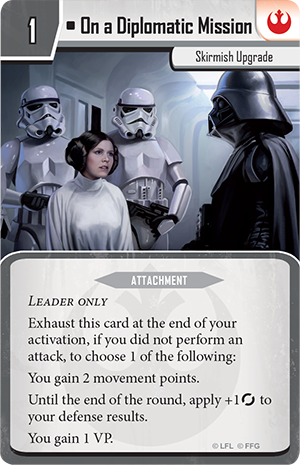 This card is attached to one of your Leader figures, and if you did not attack during that figure’s activation, you may exhaust On a Diplomatic Mission to choose one of three options: you can gain two movement points, gain a constant evade added to your defense until the end of the round, or gain one victory point! Essentially, On a Diplomatic Mission allows you to tailor your response to any situation. If you need to race to get into position or carry an objective, you can gain movement points. If you’re in danger of attack, you can increase your defense with a constant evade. If you’re within grasp of victory and just need a few more points, you can inch closer by grabbing a victory point. No matter what your current situation, On a Diplomatic Mission is always useful. 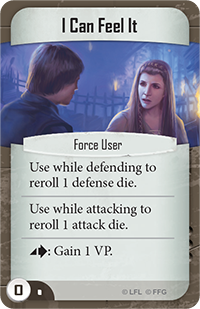 The Leia Organa Ally Pack also features three new Command cards that you can use to infiltrate enemy installations and tap into Leia’s innate connection to the Force. 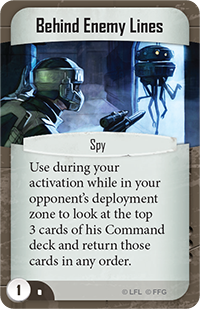 Behind Enemy Lines can be played while one of your Spy figures is in your opponent’s deployment zone to let you look at the top three cards of your opponent’s Command deck and rearrange them in any order—giving you vital information and some control over your opponent’s upcoming combat tricks. If you want to bring Leia’s Force connection to the surface, you can simply play There is Another . 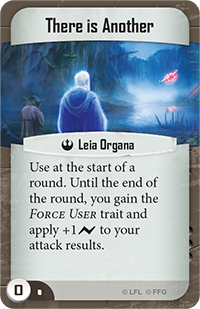 When you play this Command card, Leia gains the Force User trait, along with a constant surge to her attacks until the end of the round, helping her trigger her impressive array of surge abilities. Then, you can play I Can Feel It on Leia Organa or any other Force User to gain a number of powerful options. You can play this card while defending to reroll a defense die, while attacking to reroll an attack die, or just to gain a victory point if you’re closing in on the win! Whether you engage the Empire in diplomatic talks or lead your strike team from the front, Leia Organa can make a powerful Leader for any team of Rebels in a game of Imperial Assault. 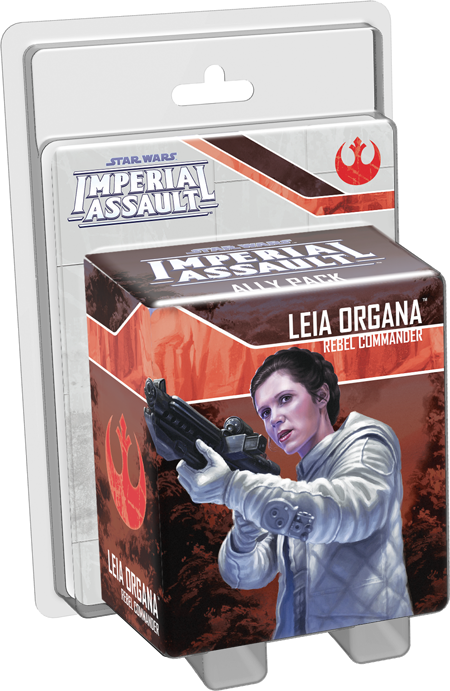 Lead the forces of the Rebel Alliance to safety with the Leia Organa Ally Pack and join us next week for another Imperial Assault preview! Pre-order your copy of the Leia Organa Ally Pack at your local retailer today.